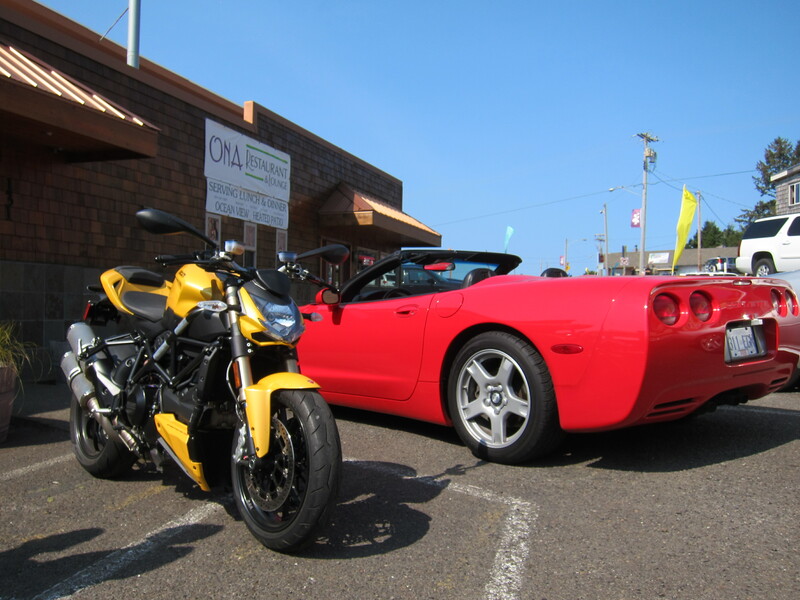 The Ducati goes to Yachats on the Oregon Coast. Again! 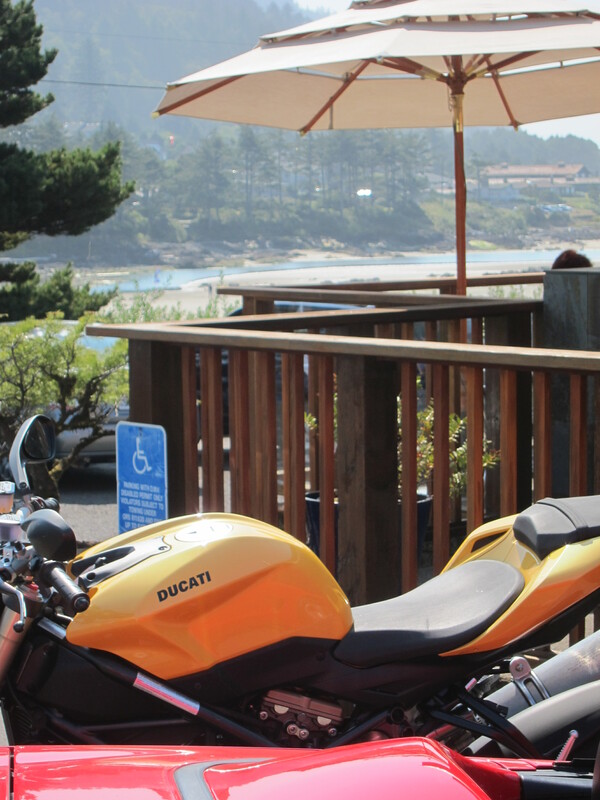 One of the fellow motorcycle bloggers in the Pacific Northwest, or maybe he would say Pacific Southwest since he is in beautiful British Columbia just north of the border, invited me for lunch on the coast. Bob and his wife Yvonne were traveling by car and were in this area Sunday, and suggested the Ona Restaurant in Yachats as a meeting place this Sunday at 12-noon. I responded that if the weather was good I would be there. And Sunday came and the day was just beautiful. A perfect riding day, not too hot, not too cold, with temperatures below 60 degrees in the morning and never past 75 i the afternoon. I took my customary pacific loop route, the no-thrills version, no detours added to it, just stops for pictures along the way, of course. First stop, let’s check the corn. Later this same Sunday, when I was back in Eugene, I had a nice dinner and had some corn: I will let you in a secret here, just don’t tell too many people, but fresh corn from farmers in this area is so good that adding salt and butter spoils the experience. 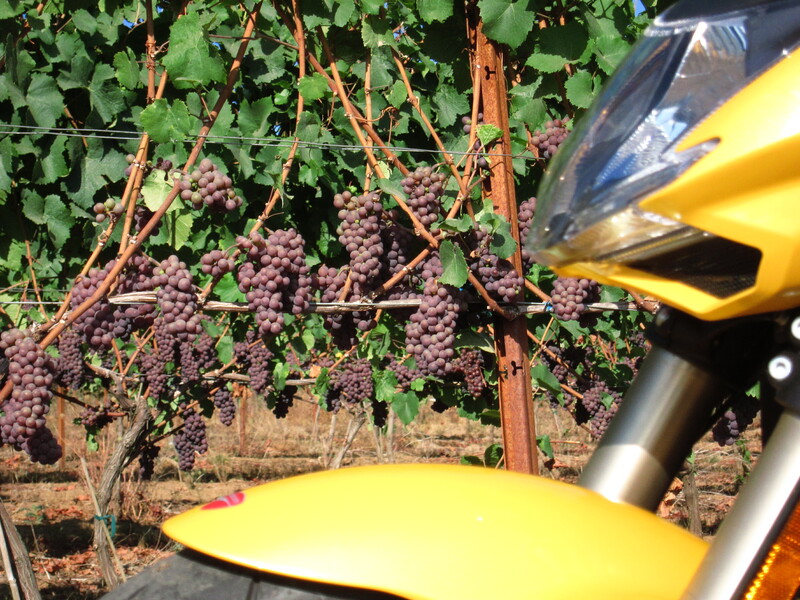 Next stop, let’s check the grapes. 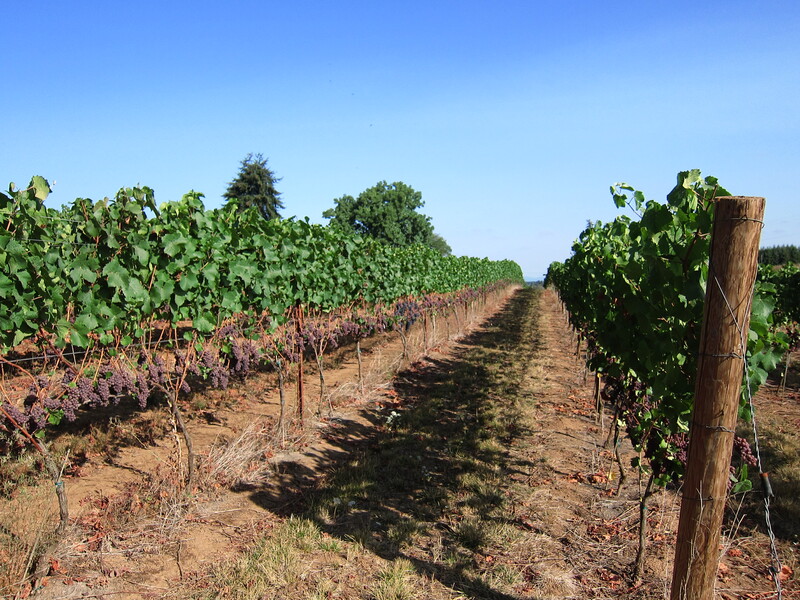 Same vineyard from last week, one week’s progress is noticeable. Oregon wines are worth a try if you haven’t yet. If things keep going the way they are, I will be interested in tasting the 2012 wines a couple of years from now. Along the valley, more signs that we are in the first days of the fall. It reminds me that my parents’ wedding anniversary is on one of these days. Happy Anniversary Mom and Dad! How many years is that? One picture without the bike, so you can really see what I’m talking about. I stopped for gasoline in Philomath, at the non-ethanol gas station and from there I got onto Hwy 34. 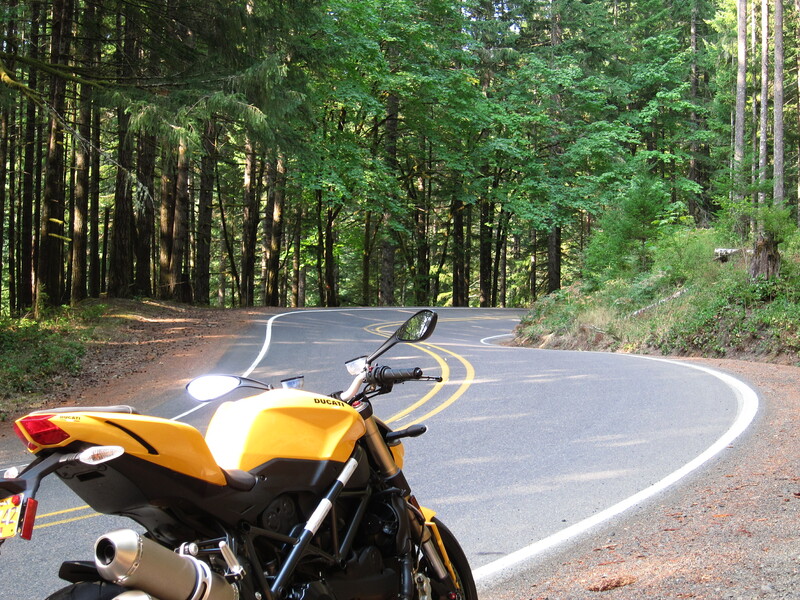 Now, if you ride motorcycles and don’t know this region, you should know this road has a nice set of 2nd gear curves on the way to the Alsea summit (where the road to Mary’s Peak starts). A quick stop for a view of the Alsea River, just before getting to Waldport. It looks better with higher tides when the ocean dams the river water, but this will do for now. From here I got to the Ona Restaurant in Yachats in about 10 minutes. It was easy to locate Bob and Yvonne, as they were seating outside and he had his camera pointed at me as I rode into the parking area. I felt like I was a celebrity. That was the first time I met Bob and Yvonne. We had a great meal, with a pleasant conversation. 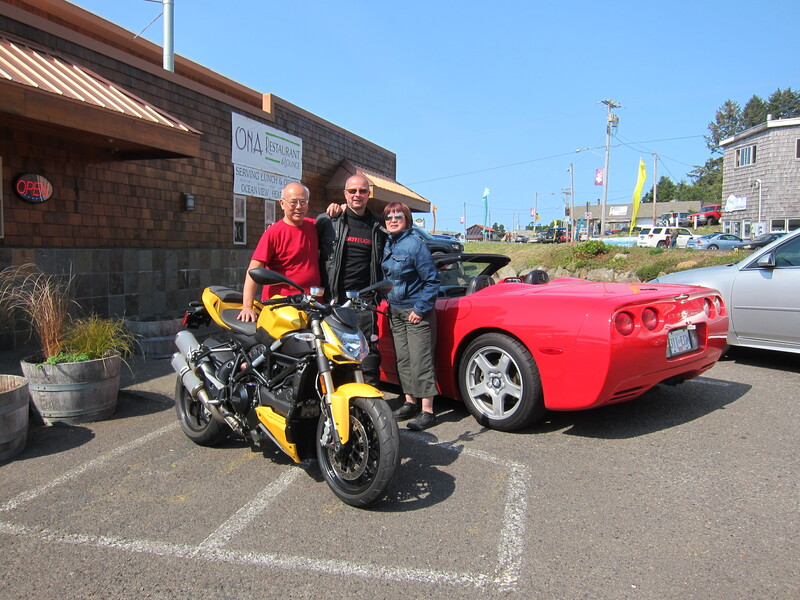 Bob and Yvonne had driven their Corvette from British Columbia and this area between Yachats and Florence was as far south as they were going to be on this trip. And with this weather, with the top down on a nice Corvette, this must as good as riding. After the meal we went out for a photo shoot in front of the restaurant. Here are the three of us. All looking good, happy and well fed. Thanks for the meal Bob and Yvonne, food was really good and the company better! We parted ways, and still saw each other a few more times on the road, as we crossed each other at a couple of photo stops along the way to Florence. It was a particularly good day on the coast, this is the time of the year when the coast is perhaps the best in terms of weather all year long. 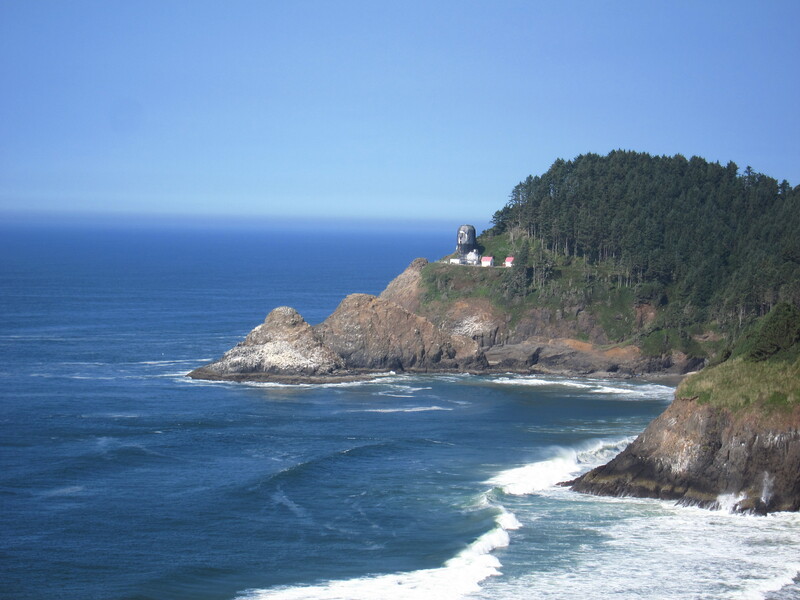 The old Heceta Lighthouse, still under re-building work. It will look great again soon. And one with the bike, of course. I had to be home by 4pm… so from the Heceta Lighthouse I just got on the bike and rode with only one stop for more non-ethanol fuel in Cheshire. 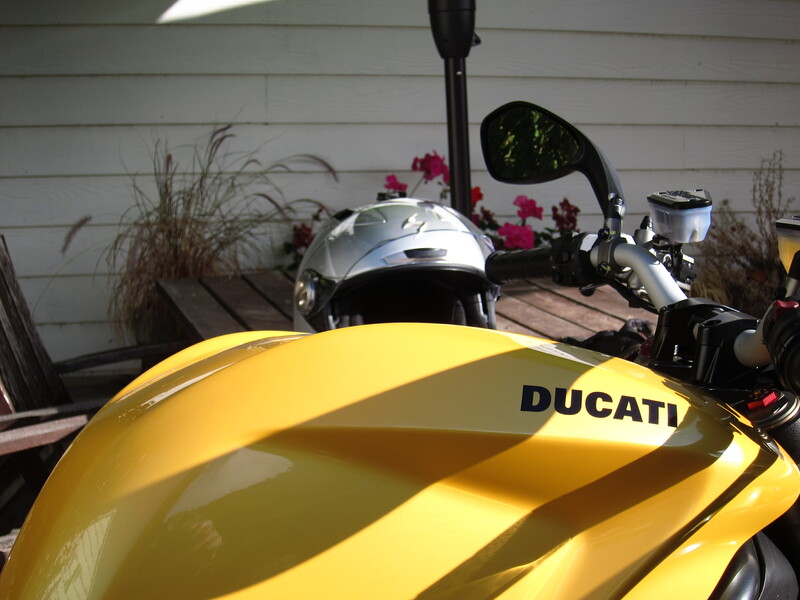 The yellow bike brought me home once again. This thing is a blast to ride and each time I ride it I like it better, I tame it one bit more. Total for today’s ride, 216 miles (348 km), the length of the minimalist version of the loop. It was another good day. 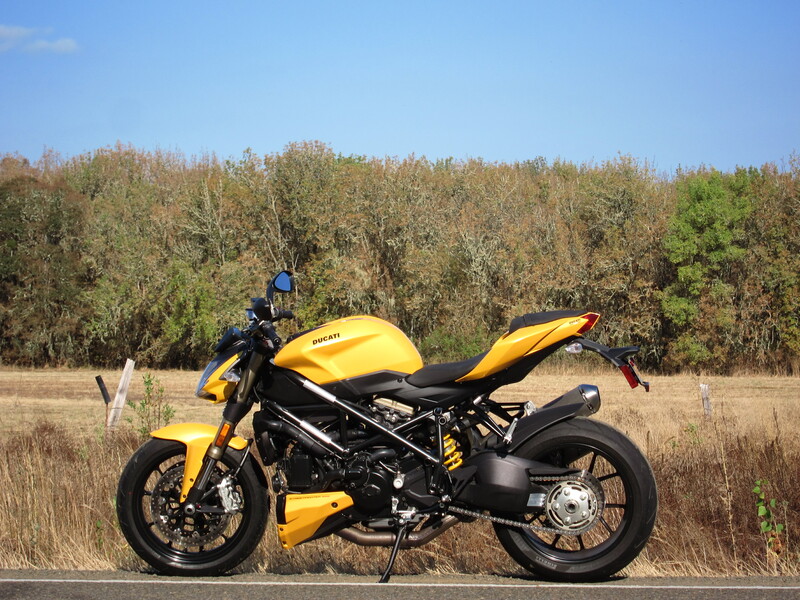 This entry was posted in Riding the Ducati and tagged Ducati, Ducati Streetfighter 848, Oregon coast. Bookmark the permalink. 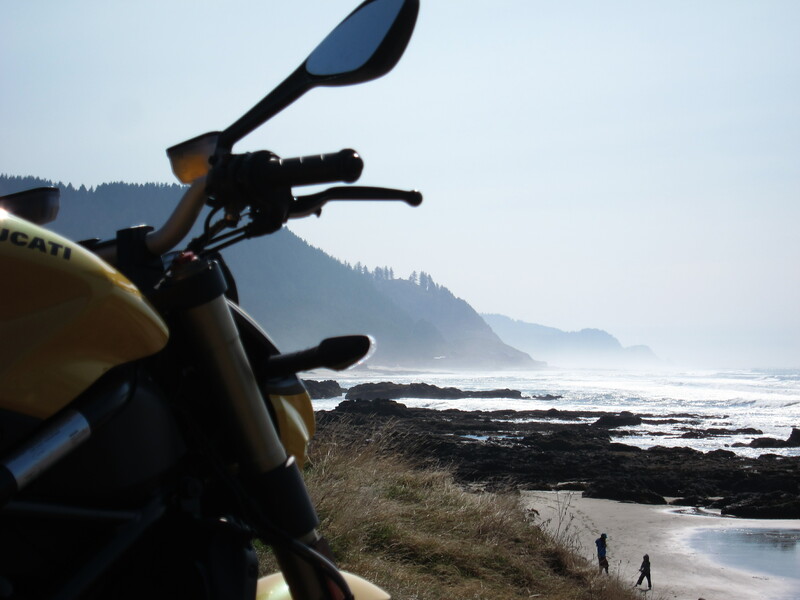 8 Responses to The Ducati goes to Yachats on the Oregon Coast. Again! Great write up. Always nice to see bloggers getting together and Bob and Yvonne had two meet ups yesterday. We met them for a nice dinner at the Woodsman in Philomath – the best Thai food in our neck of the woods. 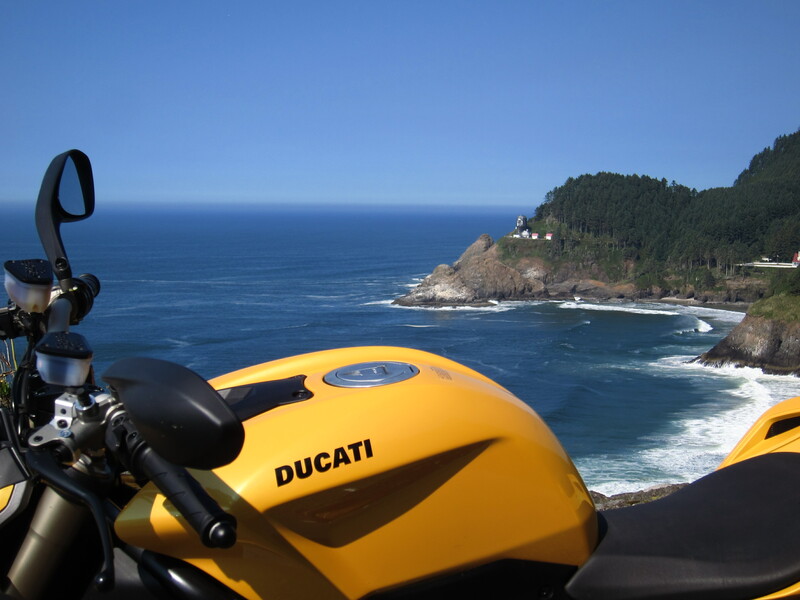 That Ducati yellow sure is pretty against the blue of the ocean. A nice contrast to Bob’s Corvette too. Troubaritz, thanks for the update. I’m glad they found their way to dinner yesterday. And thanks for the tip on the Thai restaurant, I will have to try it at some point. And yes, that bike has something about looking good on the photos and making simple photos look good. These Italians… they know a thing or two about design. I found your blog in a link on Bob’s blog. I had the opportunity to meet Bob and some fellow motorcycle bloggers this summer in Hell’s Canyon, OR. I think Bob’s quite a character. He was fun to hang out with for the few days we were together. I also met, Brandy-Brad, Sonja-Roland, Karen, and Richard. All fellow bloggers. 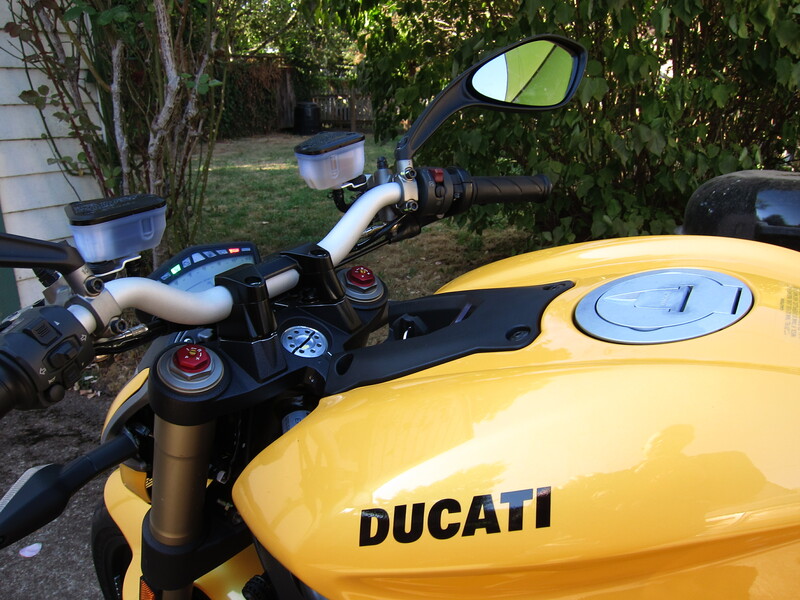 I, like Trobairitz, (Brandy), think your yellow Ducati looks great in the pictures. Nice blog! Indeed, Bob is quite the character. And seems to be enjoying life very well! Good to read your comment Erik, and know about the meeting you had in Hell’s Canyon this year and the community of bloggers (it helps with connecting the dots). Hell’s Canyon happens to be an area I haven’t been to yet in Oregon. And thanks for commenting and for the compliments on this blog. it was a pleasure to meet you too. I just got home, unpacked and put everything back into their proper spots. Now I can relax. 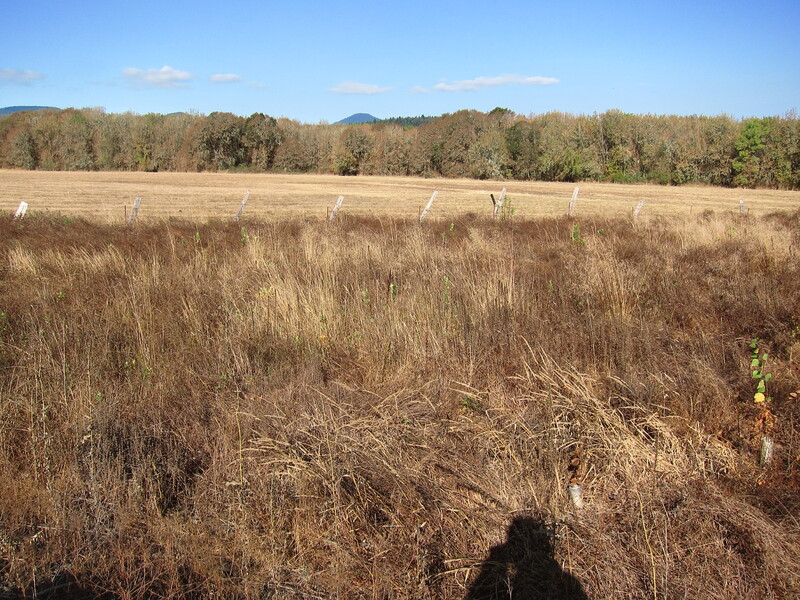 I must be a klutz, this is the 2nd time I have been on hwy 34 and tried to find that FS road to Alsea Falls. I kept looking at every road and I must have passed it again. When I was there in July on my V-strom there was no traffic, but on Sunday when I was prepared for those twisties, guess what ? I got stuck behind several cars who have never seen a curve before, and it was braking hard on every corner — instead of “gunning it”. The road to the Alsea Falls starts in the town of Alsea. 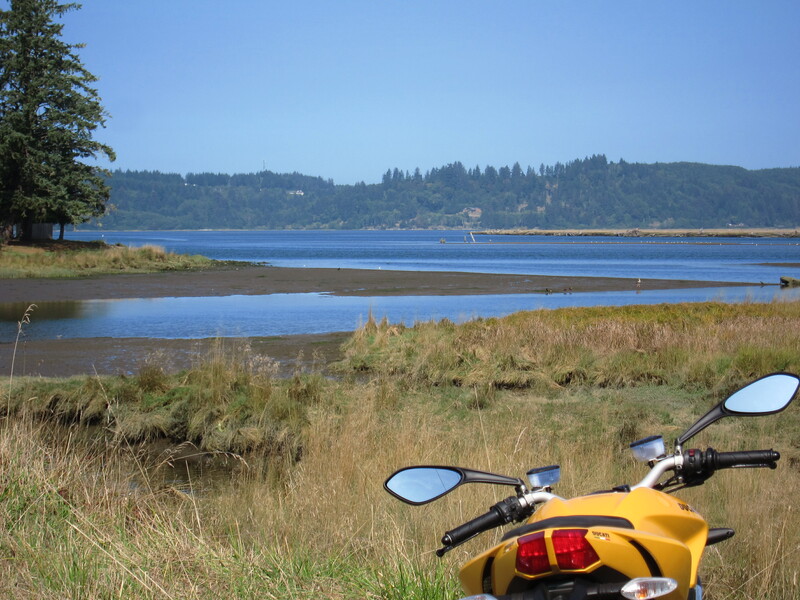 It goes straight south from Alsea, then you go lft on a fork, take the South Fork Alsea Access road, which after the falls will eventually become Alpine Road and will end close to Monroe. Looks like a good day out in the countryside with a nice lunch break with bob. 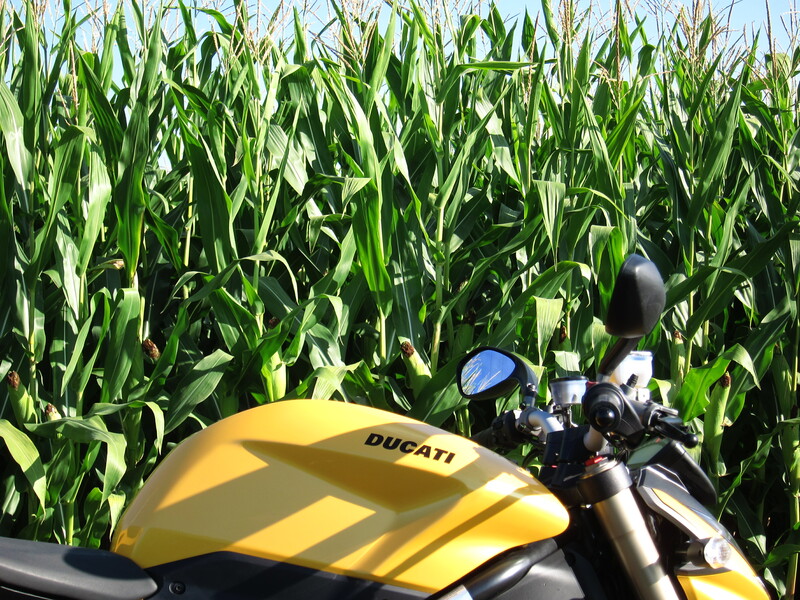 How comfortable is the 848 on some longer touring runs like 400mile+ days? I ride it almost every Sunday, but I only stay at the 200+ range. It is very comfortable, for the bike ergonomics I probably could easily do 400 mile days. The one thing that could be bothersome is that it has no windscreen. Riding at 70+ miles for too many miles, you will need a good silent helmet and good ear plugs.